While the World Hearing Day (3rd March) raises awareness on preventing deafness and promoting hearing care, I’d like to consider how we can contribute in making lives a little bit easier for those who suffer from hearing loss. 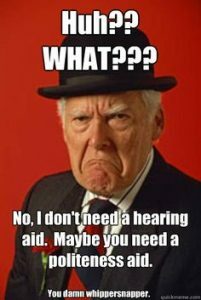 I would like to focus on folks who can hear but need a little or a lot of help from hearing aids. It isn’t always easy to know who suffers from a hearing loss as most people tend to be discreet about this. Not all of them like to go about announcing it to the world: “hey look world, woohoo I am deaf!”. I believe there still is a stigma attached to hearing loss; whether it is a socially constructed stigma or a self-imposed embarrassment of having this loss. It can impact a person drastically in their social lives. It can reduce them into a shell of a person they once were, especially if they have recently become hard of hearing. I think it is great that we have this awareness day and that knowledge is being spread so it no longer becomes a stigma or a source of embarrassment. Maybe I am wrong here, but I have always noticed that people who were glasses don’t always carry that stigma or embarrassment. Television, movies and books tend to give the glasses wearers positive attributes or make them attractive by way of saying “she does have that cute librarian look about her” or “He looks very smart with his carefully side parted hair and black rimmed glasses”. I don’t know about you, but I have never heard anyone say “With that high ponytail, and hearing aids, she looks so on point” or “I love those hearing aids, they are so cool”. Maybe, after that movie Creed (in which a singer happens to wear hearing aids), things may change. Think about the office space, general outdoors, the noisy bar, and even home – where noise and even quietness can provide a tough challenge for the hearing impaired. Despite what a hearing aid can do, the struggles of every-day life continues. 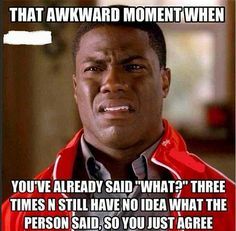 The struggle of straining to lean forward as much as possible so they can grasp every single word that’s coming out from a softly spoken person is a strenuous task. The struggle of hearing one person speaks on the other side of the table while multiple conversations are happening is maddening. The struggle of hearing that damn whistling sound coming out of their ear when speaking to someone on the phone is irritating. You know, the list goes on. Oh, for some people, they get headaches from prolonged use. So, where was I? Yes, how to make it easier for people who wear hearing aids? Don’t shout – come on, don’t be an obnoxious fool. Speak up and clearly. Often than not, some hearing aids wearers can lip read. Don’t misread signals. If someone is watching your mouth when you speak to them, chances are they are NOT interested in you in that way. So yeah, don’t. In a place where multiple conversations are happening, sit next to them when you wish to talk to them. Don’t sigh with impatience when they ask you to repeat what you said. It’s not polite! Even with your closed ones, don’t ever ask “Did you hear what I said?” Of course, they can’t hear well, and they don’t need you reminding them. Just calmly repeat. Another thing – never ever ask them “are you wearing your aids?” especially half-way through your conversation. Don’t be so condescending. Just repeat. If you have a soft-spoken voice, try to get close as possible to the person (without invading their personal space obviously). Don’t place your hands over your mouth when you are talking. Don’t talk with your back turned. It’s worse if they are lip readers and even worse, if you are soft-spoken. When watching television, put on subtitles. Make life easier for them, will you? If at work, try to round up minutes of your earlier conversation with them in an email and do not write “Just so you didn’t hear me properly –”. This will help give them confidence to do their work well and get stuff done. If at school/college/university/work seminar, don’t point them out and ask questions. Let them put their hands up and answer the questions. Actually this is a universal issue, don’t do it, period. Don’t squirt water or any sort of liquid around/near their face. It can damage their hearing aids. Yeah, those gremlins come with a heavy price. If you are socialising, do choose a slightly quieter bar/restaurant but obviously do ask them. Who knows, they might actually prefer to go to a noisy restaurant because the food is great. Finally, treat them with kindness, not with a burden.